This book is the result of many chance encounters all rolled into one. I think it is safe to say it wouldn't exist if it wasn't for the ongoing Amiga show scene. Funding of the book wouldn't have happened if it wasn't for crowdfunding. And yes, my name is listed along with many other backers. Printing of the book wouldn't have happened if it wasn't for a certain active Amiga dealer. Needless to say, it was a long journey for this book so I was eager to find out if it was worth the wait. The book is split into two parts. This was a bit of a surprise for me because I was expecting a book full of insider stories from David Pleasance alone. The dual personality turned out to be a blessing because, as I found out, David was really just a sales guy when you get right down to it. So he flushed out the book with a series of guest writers who handled the more technical insider information. The end result is a much more balanced work. The first part is David Pleasance's stories of his time at Commodore. David's stories are simply amazing. I expect this is what happens when big money is flying around in a business that was still finding its place in the world. Through it all, David managed to keep his integrity in tact which is more than we can say for many of the other characters at Commodore. 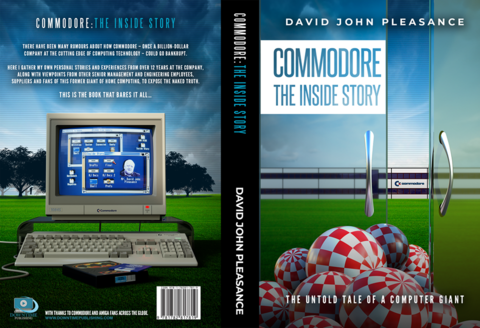 The second part of the book is a series of articles by Commodore insiders. I especially enjoyed the stories from RJ Mical, Dave Haynie, Gail Wellington and Beth Richard. There is some really fascinating things that went on inside Commodore and it was nice to have several perspectives to pull from. My only real criticism would be the out of place piece by Stephen Jones. It just doesn't seem to belong in a book about insiders at Commodore and reads more like an advertisement. My other criticism is that there are not enough insider stories! Let's hope he adds a few more in a second edition some day soon.